The Elder Scrolls Online is a massively multiplayer online role-playing game spin-off of the Elder Scrolls franchise. It takes place roughly 1,000 years before the events of Skyrim, specifically, the year 2E 582. With the end of the Reman Dynasty at the end of the First Era, the Dragonfires go out without an emperor to light them. With the absence of a clear leader, three warring factions—the Ebonheart Pact, the Aldmeri Dominion, and the Daggerfall Covenant—use the opportunity to expand their territory, at the expense of their rivals and the residents of the Imperial province of Cyrodiil. The Tharn family (the family of the infamous Jagar Tharn) forges an alliance with Mannimarco to assist the depleted and surrounded Imperial Army by reanimating their dead. 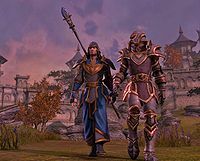 Secretly, Mannimarco betrays his Imperial allies by assisting the Daedric Prince Molag Bal in invading Tamriel in an attempt to incorporate it into his realm. The player character is one of Molag Bal's victims, who has had their soul stolen by the Daedric Prince. The gameplay featured in The Elder Scrolls Online is radically different from that of its predecessors. The game can be experienced from the third person, first person, or over the shoulder, with full first person receiving just as much support as the other views will. Character creation and development is class-based, with level progression being experience-based rather than skill-based. Combat will be in real-time, based on health, stamina and magicka, with a focus on the stamina-bar, which controls their ability to block, break, and interrupt enemy attacks. All players can sneak, but doing so consumes stamina. There is no pickpocketing or stealing from other players in the game . The player also controls the use of special abilities that come from their equipment or their abilities. There will be four classes to choose from at character creation: Dragonknight, Nightblade, Sorcerer and Templar. Classes in The Elder Scrolls Online are only a starting point for a character . Any character can equip any weapon or armor and master its use  . Each class has three skill lines that suggest a playstyle for that class. Three of the classes adhere somewhat to the traditional MMO roles of tanking (Dragonknight), DPS (Sorcerer) and healing (Templar) while Nightblade utilizes sneak. All ten previously playable races will be available; however, Imperials will only be available to those who buy the Imperial Edition of the game. The Standing Stones from Skyrim return as "Mundus Stones", providing a permanent buff to the player character when activated. Questing is similar to Skyrim, with random encounters and minor tasks being available alongside more full-fledged quests. Due to the issues resulting from player actions conflicting with other players' actions, the quest system features a system known as "phasing", with the world mostly only being altered to the player character instead of all players. Players can join other players in an earlier phase of a quest, with the world temporarily reverting a quest to the state it was in at the time for players ahead of their companions. The player is free to join any and all guilds in the game, and the guilds will ask you to perform certain tasks, such as destroying Dark Anchors—anchors that Molag Bal uses in his attempt to pull Tamriel into Coldharbour—to gain favor, rewards, and status with the guild. It will take an estimated 120 hours of play time to reach the level cap. 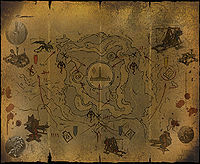 After the level cap of 50 has been reached, one can explore another alliance's territory . There are three playable factions: the Ebonheart Pact, made up of the Argonian, Dunmer, and Nord races; the Aldmeri Dominion, made up of the Altmer, Bosmer, and Khajiit races; and the Daggerfall Covenant, made up of the Breton, Orc, and Redguard races. Races are restricted to these factions, except for players who own the Explorer's Pack, which removes this limitation. There will be six professions for a player to choose from: Provisioning, Blacksmithing, Clothing, Alchemy, Woodworking and Enchanting. Players can master as many professions as they want, given enough time and skill points. Crafting is similar among all the professions and based on experimentation; recipes require one primary ingredient and one secondary ingredient, and up to three additional components called "additives". While the item can simply be made with the primary and secondary ingredients, using additives will greatly speed up progression in the chosen profession and the strength of the item. Player versus player combat only takes place in the province of Cyrodiil. All three factions are attempting to seize control of Cyrodiil and put one of their members on the throne. By seizing control of locations (Keeps) and stopping opposing factions from conquering their territory, a faction will earn faction-wide bonuses for its members and eventually be given the opportunity to assault the Imperial City and drive out the Daedra occupying it. Once a faction takes control of the Imperial City, the player who made the most contributions to the war for that faction will be crowned emperor. All players above level 10 can participate in the PvP combat and level doing so, but the leveling will not be as constant as in player versus environment . All players in Cyrodiil will be level 50. Those who have not yet reached the level cap will be scaled up to be competitive, but they will have fewer skills and abilities available to them than those who leveled naturally . Since certain familiar aspects of NPC schedules (such as waiting out the night for NPCs to awaken again) isn't an option for an MMO, the game doesn't use Radiant AI. While the specifics have yet to be revealed, the system that is implemented in the game should resolve timing issues for players who can't play at ideal times. Just as you can alter locations without it drastically changing the game world, you can also save or kill NPCs without it affecting other players due to phasing. Like in Oblivion and Skyrim, NPCs in The Elder Scrolls Online are fully voiced. The world is alleged to be considerably larger than any of the previous games, with Arena and Daggerfall almost certainly being exceptions. The game will encompass most of Tamriel, and the only parts that are excluded are certain regions of provinces that are being reserved for expansions. One example of this that was provided was the city of Winterhold, which is not scheduled to be released with the game. Because of this, all of the provinces will be present on launch day, but not every single part of each province will be available initially. The province of Cyrodiil is particularly worthy of note. 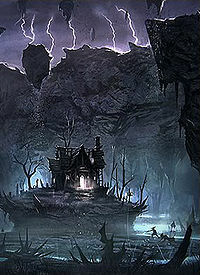 To make the province look and feel the same way as the province did in Oblivion, certain aspects of Oblivion, such as the game's height maps and locations such as caves and ruins, have been replicated in The Elder Scrolls Online. 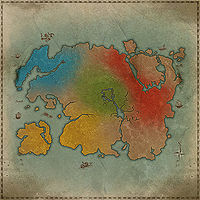 The game will feature most of the cities that dot Tamriel, along with a number of minor locations. There will also be a number of entirely unmarked locations that can only be discovered with thorough exploration. Tamriel is divided by three different factions: Skyrim, Morrowind, and Black Marsh are territories of the Ebonheart Pact; the Summerset Isles, Valenwood, and Elsweyr are part of the Aldmeri Dominion; Hammerfell and High Rock are parts of the Daggerfall Covenant. The only province that isn't clearly controlled by any one faction is Cyrodiil, which is technically controlled by the unplayable Imperial faction, though all other factions contest their claim to it. The Dark Brotherhood, Fighters Guild, Mages Guild, and Thieves Guild are all present and joinable for those wishing to become a member of a guild. Only Fighters Guild and Mages Guild will be available at launch . Many creatures are returning from previous installments of the franchise. Those so far shown or mentioned to be returning include Daedroths, Dreugh, Durzogs, Dwemer Automatons, Flame Atronachs, Flesh Atronachs, Frost Atronachs, Giants, Kagouti, Liches, Mammoths, Ogrim, Scorpions, Skeletons, Spider Daedra, Storm Atronachs, Vampires, Werewolves, and Zombies. New creatures will be introduced like the Bone Colossus and Dunerippers. Transformational diseases like Lycanthropy and Vampirism will be present, but unlike previous installments it has been mentioned they will be restricted and applied within certain quests and perks. The game was officially announced on May 3, 2012, to mixed reactions from the fan base. The game is scheduled for release in spring 2014 for Mac, PC, PS4 and Xbox One, and is being developed by ZeniMax Online Studios. 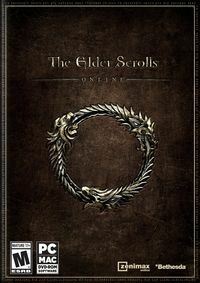 Speculation relating to the development of an MMO set in the Elder Scrolls universe has existed since the creation of ZeniMax Online Studios in August of 2007. The rumors grew after the registration of ElderScrollsOnline.com by ZeniMax in November of the same year. Despite the rumors, ZeniMax and Bethesda remained entirely silent about the potential development of the game, even refusing to comment when an anonymous source revealed that they were preparing to announce the game just over a month before the official announcement. Due to the nature of an MMORPG, many user-created modifications are impossible as they could affect other player's experience within the game. User-created add-ons are allowed, however, to do things such as altering the interface. On January 22, 2013, ZeniMax began allowing players to sign up to be considered for beta testing. Players were subject to a nondisclosure agreement (NDA) until February 15, 2014, when the NDA was lifted. On March 26, 2013, ZeniMax sent out the first wave of invitations for the beta tests. Additional invites were sent out as beta testing progressed. August 21, 2013 saw the reveal of the much wondered about payment that would be used in Elder Scrolls Online. It was revealed that the game would require a monthly subscription cost estimated to be $14.99/€12.99/£8.99 for every month after the first month in which the game was originally purchased. Discounts for purchasing a subscription three or six months long were offered as well. From March 17, 2015, Elder Scrolls Online moved to a buy-to-play/freemium hybrid under the title The Elder Scrolls Online: Tamriel Unlimited. Owners of the game are able to play for free with no subscription required, with an optional premium service called ESO Plus becoming available at the previous rate of $14.99/€12.99/£8.99 per month. Tamriel Unlimited also saw the introduction of the Crown Store, an in-game cash shop offering convenience and customization items. Elder Scrolls Online Website - The official website for The Elder Scrolls Online. Elder Scrolls Online Twitter Account - The official Twitter account for the game. Elder Scrolls Online Forums - The official forums for the game. Elder Scrolls Online Facebook Group - The official Facebook group for the game. Game Informer Game Hub - A news hub for the game, provided by Game Informer. Elder Scrolls Online Subforum - A place on the UESP forums where you can discuss the game. ^ The Story text was originally found at http://elderscrollsonline.com/en/game-guide/story. Following an update to the official website, this is no longer available. ^ Elder Scrolls MMO Announced! ^ Sign Up for The Elder Scrolls Online Beta Test Today! ^ The Elder Scrolls Online Coming to PlayStation 4, Xbox One! This page was last modified on 24 October 2018, at 21:26.